Two years ago to the day was the first time I installed Linux on my computer. Sure, I had seen other people use it and had used it on other people's computers (though not so frequently), but I had never before put an OS other than Microsoft Windows on my own computer until that day. I had talked to a friend of mine about it before because I was planning to do it for a while; I thought of installing Ubuntu, but he suggested Linux Mint, as it would be easier for me to get used to and work with. I took that advice, and on 2009 May 1, as I took a break from studying for AP exams and felt quite fed up with Microsoft Windows XP, I downloaded the Linux Mint 6 "Felicia" GNOME ISO file, got InfraRecorder for Microsoft Windows XP, burned the live CD, and went on my way. Since then, I've used two newer versions of Linux Mint, and I've gotten a newer computer as well. I'm still quite pleased with and fond of Linux Mint; it's fast, stable, secure, and it does what I want it to do (most of the time). Sure, there have been some minor hiccups along the way. For example, until recently, I wasn't able to view Hulu on my laptop as I have installed the 64-bit edition; thankfully, that has been fixed. Occasionally, the desktop will start without window decorations, at which point I would have to start the Compiz Fusion icon to reload the Compiz WM that I'm using under GNOME. I have had to lock one package because upgrading it broke it when I tried to get the latest version of a different package through a common repository. But otherwise, my experiences with Linux Mint have been very, very positive, and I could never see myself using Microsoft Windows on a regular basis again. Right now, Linux Mint 9 LTS "Isadora", which is what I'm using now, is supported for the next two years. If the Linux Mint developers do release an Ubuntu-based version 13 LTS "M[...]a", then I will switch to that when it comes out. If not, then I will stick to this for the remaining two years, and then I will in all likelihood switch to the latest snapshot of Debian-based Linux Mint. I do have other backup plans, though; I really like #!, and it's based on Debian Stable, so that seems like a pretty good option as well. MIT offers RHEL (Red Hat Enterprise Linux) to students, and it should be offering RHEL 6 by the end of this semester (in a few weeks), so because RHEL is supported for 10 years, that looks like a pretty good option as well. That's the beauty of the Linux ecosystem; if for whatever reason I don't like something, I can always start using something else. i was fed up with virus and later anti virus in windows (both almost broke my computer).. that time i have read about the new release of ubuntu in local newspaper..that time i had a slow connection..so i searched google about ubuntu..then somehow i found linux mint..the reason why i switched to linux mint is that ubuntu was so ugly that time with brown color while linux mint was looking like windows and better than ubuntu..
i can't imagine windows for 1 month as i am sure that it will have some problem during that 1 month.. if virus has not broke my pc i'm sure one of the anti virus update will definitely brake it..
Hey I like Linux Mint, and it's been great to em the last year or so, and Ubuntu before that for almost a year. I used to run windows, but after problem with viruses, and issues with antiviruses I just got tired of it being almost unusable. I got tired of the whole almost ten minutes to a usable desktop. It was enough for me, and that was when I made the jump to Linux. @jai ho: Yes, I was similarly frustrated with viruses and memory hogs that are supposedly antivirus programs. Also, I switched to Linux Mint mainly because (1) I didn't know any better so I thought it would be best if I just listened to my friend and (2) it was supposed to be friendlier to Microsoft Windows migrants. This may surprise you, but I actually really liked the brown color theme in past versions of Ubuntu because (1) I happen to generally like the color brown as well as combinations of 'earthy' tones and (2) it was just different from the standard Microsoft Windows XP theme which I had grown sick of seeing over and over again. @Anonymous: I have tried it, and you should check out my comparison of Pinguy OS 10.10 and Linux Mint 10 "Julia" on this blog. I will say though that my opinion of each has changed more since doing that comparison test. @lycan 762: Yep, the story was pretty much the same for me; I was just getting sick of the slowness, instability, and lack of security in Microsoft Windows. At work, I am forced to use Windows (ticket tracking system only works in Windows, my company's timekeeping system requires IE). So to get around it, I installed Mint 10 on all of my PCs with Virtualbox 4.x. I run Windows as a VM. The OS works great, and I can provide IT support to my client. Looking forward to Mint 11! @Anonymous: They let you install another OS and run Microsoft Windows virtually inside your preferred OS? That's pretty awesome, if you ask me. Thanks for the comment! I've been a loyal Red Hat/Fedora user since Red Hat 6. I still have to use Windoz at work, and keep a Win7 machine for my iPhone support. At work, I have been using RHEL5 and VMware with a Win7 guest OS. I support various *NIX OSes as part of my job, so I would say that I am not a newbie. I installed Linux Mint 10 after reading an article online. I found LM10 to be smooth, pretty, functional and it quickly replaced RHEL5 on my desktop. I'm no fan of the 'sudo' stuff, so that part I did not like and it is geared a little more toward the end user instead of the techie (programmer), but in everyday use, I, like everyone else, is an end user. I use Linux to store and play all of my music, I have to have (Windoz) iTunes to put music on my iPhone, at least I thought I did. VMware didn't work. I tried many times to get the VMware USB driver to work with iTunes and my iPhone until I gave up. The other day, my iPhone suffered battery failure, so I connected it to my (now three months old LM10) workstation and got distracted doing something else. When I returned to my workstation, I noticed Rythmbox was open, my music ( I had been playing with AMAROK) was open and my iPhone was displayed in the navigator panel. I clicked on the iPhone icon, lo and behold, there was my music. I clicked on the music (library) icon, dragged an album to my iPhone and it started syncing. Linux Mint 10 is by far, the best desktop OS I have ever worked with. @Anonymous: Well, it's great that Linux Mint was able to recognize your iPhone, because to this day Linux and Apple devices don't reliably mix well, and that can be a sore point for many users. Also, you don't have to use "sudo"; you can "su" as always. Finally, did you try using VirtualBox instead? I don't know that it would have made much of a difference, but I do know that it supports guest OSs recognizing USB devices plugged into hardware recognized by the host OS. Thanks for the comment! Mint loaded like a dream. Thought I would give it a test run. Unfortunately, I couldn't get the nvidia flicker to abate even after trying a series of recommended work arounds. So,had to dump it and go back to Ubuntu. @Anonymous: Did you use Ubuntu-based or Debian-based Linux Mint? I can see where issues would arise with the latter, but if you ask me, the former should work at least as well as Ubuntu in that regard. Thanks for the comment! Mint is great. I was a Debian user and tried Ubuntu 11.04 and Fedora 15 but settled with Mint Debian - It gave a good balance with aesthetics and control. @Anonymous: It's great that you like it too. Thanks for the comment! Nice write up though! I'm a Linux Mint user myself, and though I had played with it a lot before, Linux Mint 8 was the first GNU/Linux release that did everything I needed. It was the point that GNU/Linux became easier and less time consuming to use in my daily life than Windows. I went back to Ubuntu for a while after that, but now I'm back with Linux Mint 10, and am planning to stick with it so long as they maintain the main edition with the Ubuntu basis. @daemox: You might want to read that again — the LTS Linux Mint release corresponding to Ubuntu 12.04 LTS (which I never explicitly mentioned in the post) is version 13 (accompanied by the code name "M[...]a"). :D Out of curiosity, what would you do if they ditched Ubuntu altogether? I'd like to know because the Debian-based Linux Mint is getting closer and closer in polish to the Ubuntu-based Linux Mint. Thanks for the comment! I have been installing Linux Mint Debian on my friends computers who are new to Linux. Seems to be a great OS. @RWDub: Do they like it? That's the important part, after all! Thanks for the comment! Yeah when support ended for win2000 (and I never had XP) I made the mistake of buying Vista, and I hadn't successfully used it for anything at all before I decided to try Ubuntu Jaunty 9.04 and since then I have upgraded one-by-one 9.10,10.04,10.10 without using Windows at all. I did, though install KVM and Virtualbox and install my Windows 2000 as a VM on my unbuntu 10.10 so I could install some old games. I haven't tried to get my Saitek game controller to work yet though this way. I don't game much anyway. Another thing I can still do with the VM is install my old version of Nero and make playable mp3 CDs. Other than that, for important day-to-day use (browsing, word processing, scanning, printing, ..., ...) UBuntu is great and easy. Don't think I need to use anything else. @Edward: It's great that you've been able to successfully stick with Ubuntu for over a year. That said, considering that a new version of Ubuntu comes out every six months and each is only supported for eighteen months, have you considered sticking with an LTS release until the next LTS release comes? That's what I'm doing, and there's not a huge problem anymore about outdated applications thanks to PPAs. Thanks for the comment! You probably know that, but I don't like Mint as such. Mostly because of overcomplicated Mint menu. From this perspective, Linux Mint XFCE is better. Have you given it a spin? @DarkDuck: Yes, I have, and I've reviewed it here; you should read it! :D Thanks for the comment! @Arjun Krishna: True that, though remember that Linux Mint 11 "Katya" is based on Ubuntu 11.04 "Natty Narwhal". 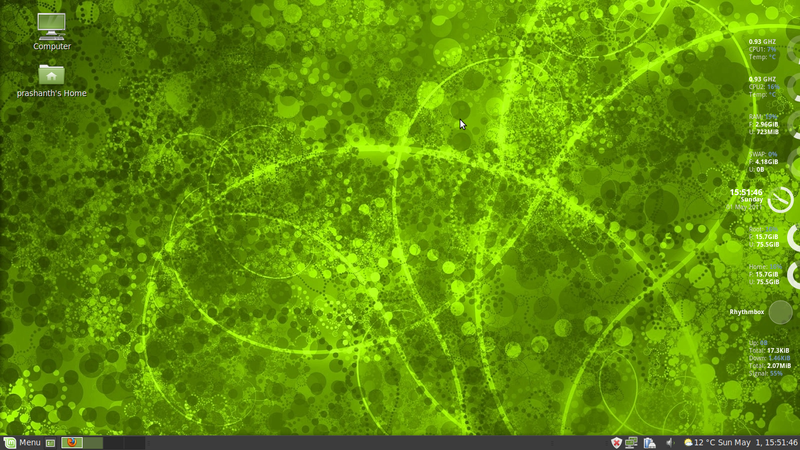 It is Linux Mint 10 "Julia" that is based on Ubuntu 10.10 "Maverick Meerkat". Thanks for the comment!